Police kill two suspects in Charlie Hebdo attack, as well as suspected accomplice who held hostages at a Jewish supermarket in Paris. Three tense days in France have come to an end, but not without tragedy, as five people were killed, including the gunman, and four were left critically wounded after a hostage drama in eastern Paris ended with a police assault on Friday, AFP reports. Gunfire erupted as police stormed the Hypercasher supermarket, where at least one armed assailant had seized hostages in Porte de Vincennes on the edge of the city. It was not immediately clear if the casualties occurred during the assault or earlier in the siege, nor whether a second hostage-taker was among the dead. In a separate incident, elite French police stormed a printworks, killing two brothers wanted for the Charlie Hebdo attack earlier this week. Explosions rocked a small printing firm in the village of Dammartin-en-Goele, northeast of Paris, and smoke poured from the building as the heavily armed forces mounted their assault as night fell. The two Islamists launched a desperate escape bid, charging out of the building firing at the security forces before being cut down in their tracks, a security source said. The dramatic climax to the two stand-offs brought to an end more than 48 hours of fear and uncertainty in the country that began when the two brothers slaughtered 12 people at Charlie Hebdo in the bloodiest attack on French soil in half a century. The hostage-taker in the eastern Porte de Vincennes area of Paris was suspected of gunning down a policewoman in southern Paris Thursday and knew at least one of the Charlie Hebdo gunmen, according to AFP. French police released mugshots of the man, Amedy Coulibaly, 32, as well as a woman named as 26-year-old Hayat Boumeddiene, also wanted over the shooting of the policewoman. 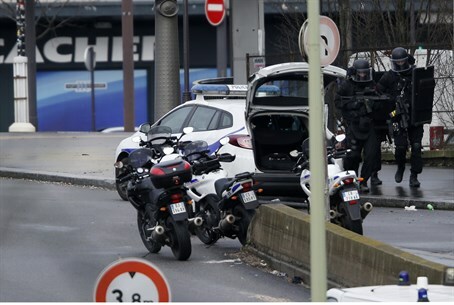 The Porte de Vincennes area in eastern Paris was swamped with police who shut down the city's ringroad as well as schools and shops in the area. In Dammartin-en-Goele, only 12 kilometers (seven miles) from Paris's main Charles de Gaulle airport, French elite forces had deployed snipers on roofs and helicopters buzzed low over the small printing business where the Charlie Hebdo suspects had been cornered early Friday. Police sources said there was a "connection" between the supermarket gunman and Cherif and Said Kouachi, accused of carrying out France's bloodiest massacre in half a century at Charlie Hebdo.